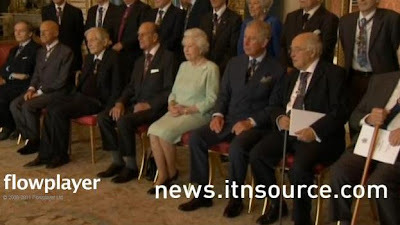 The Queen, along with the Duke of Edinburgh and the Prince of Wales, attended a service for members of the Order of Merit at the Chapel Royal, St James's Palace and afterwards gave a luncheon. Click for a video from ITNSource, then click "Watch Preview". I thought it had been a while since we'd seen this brooch - for a time, it seemed a big favorite - and sure enough, it's been almost exactly a year since its last appearance!